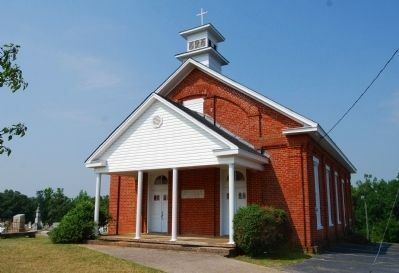 One of the oldest congregations and the mother of several others in Anderson County, it was organized in 1788 by Elder Moses Holland who served as pastor for 41 years. Dr. James Bruton Gambrell's mother was a member here. Soldiers of five wars lie buried in the cemetery. Location. 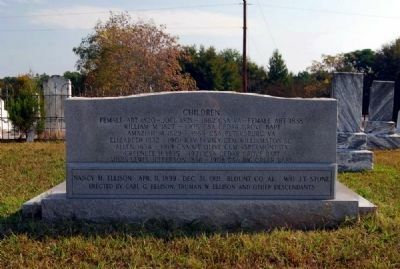 34° 37.346′ N, 82° 28.253′ W. Marker is in Williamston, South Carolina, in Anderson County. Marker is at the intersection of East Greenville Street and Hamilton Street, on the right when traveling west on East Greenville Street. Touch for map. Marker is in this post office area: Williamston SC 29697, United States of America. Touch for directions. away); Gist Rifles Monument (approx. half a mile away); Williamston 9-11 Monument (approx. half a mile away); West Allen Williams Memorial Gravesite (approx. half a mile away); West Allen Williams (approx. 0.6 miles away); Williamston (approx. 0.6 miles away); Pelzer Presbyterian Church (approx. 1½ miles away); "Lord, We Are Grateful" (approx. 5.2 miles away). Touch for a list and map of all markers in Williamston. was present at the surrender of Cornwallis. 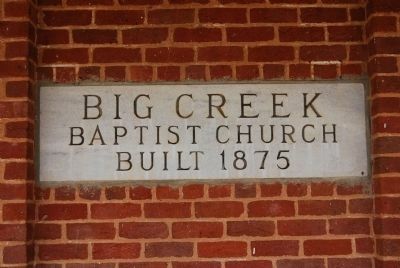 Big Creek is the oldest Baptist Church in Anderson County that has continued as an active organization since its beginning. 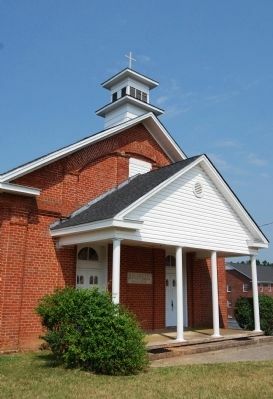 It has been argued that Shockley’s Ferry Baptist Church was organized before Big Creek, but that is no longer of concern since Shockley’s Ferry on the Savannah River ceased to exist prior to the Civil War. the effort of Rev. Moses Holland, a native of Culpepper, Virginia, who just prior to this time, had migrated south to find suitable land for cultivation and a promising field for the Gospel he felt led to proclaim. It was inevitable that upon settling along the Saluda River, in what had recently been Cherokee Indian Territory, he would begin his ministry near his home. The first few who gathered were his immediate neighbors and the meeting was in his newly constructed log cabin or outside in a "brush arbor". As the news spread from family to family, the numbers increased. In all probability Moses Holland was one of the very few Baptist ministers who settled this early in the Pendleton District. It is therefore probable that actual prayer service and preaching occurred prior to the formal organization in 1788.
of the church and is secured in the church library. Very little is actually known of the early development of the church up until 1801, when the first recorded minutes appear. If there were written records before that period, they were lost. It seems probable that they were not made since the congregation was small and business affairs simple and sparse, plus the fact that many of the inhabitants were not schooled sufficiently to maintain such records. With the written record of 1801 and later, it is evident that Brother Holland served the church and the community very successfully because in 1801, there were 108 members on the church roll. The ability of his persuasive power for the Lord is reflected in the statement that, "many raised their voice to cry, ‘what must I do to be saved?’" The spontaneous revival that began about this time continued for two more years, during which time many were added to the church and they came from many miles around to hear the Gospel as Rev. Holland proclaimed it. Notice that the east portico does not appear in this photo, meaning it was added at a later date. by a group who had been members of Big Creek. This period probably was the beginning of the events that later identified Big Creek as the "Mother Church" of the Pendleton District. 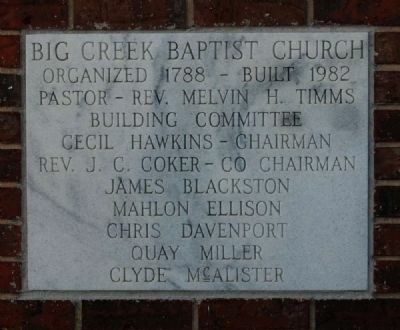 Over the years, Big Creek and Moses Holland were involved in organizing many churches in the area, such as: Neal’s Creek in 1803; Hopewell (formerly Six and Twenty); Grove Station; Shady Grove; Dorchester; Beaverdam; Williamston; Cedar Grove; Brushy Creek; Salem; Broadway; Little River; Barkers Creek; Washington; Friendship; Lebanon; Columbia; Fork Shoals; Standing Springs; Big Shoals and New Prospect (black church in Williamston). The church prospered under Brother Holland's leadership and that growth created a need for a larger and better building. About ten years after the first structure was erected, a second larger meeting house was built and located at the present site of the church. It was a frame building with a section for slaves. This structure served the community until 1875 when the present "Old Church" was built. Built during the term of Big Creek's fifth pastor, William P. Martin (pastored 1848-1873). carried the petition to Neal's Creek Church asking for Brother King's services. The request was granted and he became a member of Big Creek and the second pastor. The ties of Big Creek to Rev. 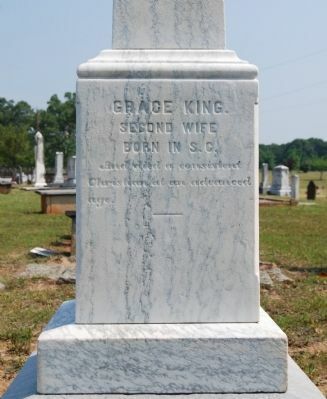 Robert King were evident, as his wife was the daughter of Rev. Holland. 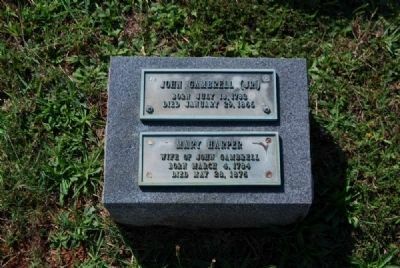 She was Miss Fannie Holland before her marriage. One must assume that this was, to a degree, a continuation of the influence of Moses Holland. In 1831-32 a national revival swept the nation and Big Creek was an active and willing participant from December 1831 to the end of 1832. During this year over one hundred members were baptized into the fellowship of the church. This was before the days of protracted meetings and was a momentous event in the life of the community. In 1833 the membership had increased to 163 members. Society. This party took the name of Big Creek Primitive Church. 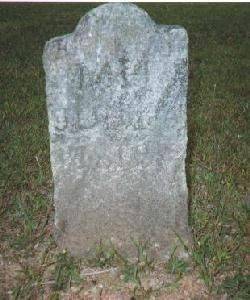 If Mr. Gaines accepted their call, he did not serve them long, for in June 1845, David Duncan, one of their members, was ordained and called to preach for them, which he continued to do until March 2, 1850, when the Big Creek Primitive Church became extinct. 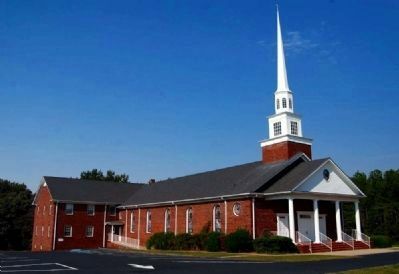 "The other party, which was the majority of the former church, remained in a disorganized condition from the division in January until October when they met and re-organized, or rather, organized the present Big Creek Baptist Church. About the first business transacted was the passage of the following resolution, which stands unrepealed till this day, viz: "Resolved, That in order to prevent straying preachers from imposing on this church and neighborhood in the future, the officers of this church shall demand of such preachers a certificate of their fair standing signed by citizens from whence they last came. "The said Musgrove was present at some one of the meetings held by the church about this time, and acted in such manner as to render himself amenable to the law. A warrant was issued at once. He was arrested and taken out of the pulpit; tried at Anderson Courthouse for disturbing religious services - Judge Evins, presiding; found guilty; and sentenced to a fine of $300 or twelve months imprisonment." survived its first and only split. On October 23, 1845, the Reverend William P. Martin was called to replace Rev. John Vandiver as pastor of the church. Demoralized, mangled and crippled as it was, the church did not present an inviting field, but Brother Martin was the man for the challenge. Revival followed revival and members were added in great numbers. The first protracted meeting was held in 1855 with 20 conversions. In another scheduled series of meetings, Bro. Martin received 61 for baptism. 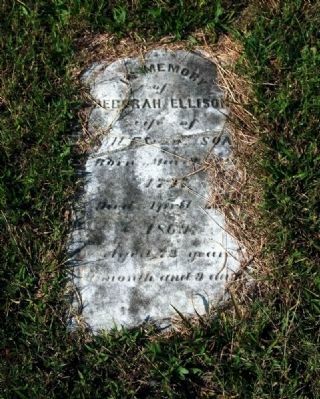 This dynamic preacher served the church from January 1846 to January 1873 and during this time span of 27 years there were added to the church 532 members, a record that would be the envy of most churches. It was with much sorrow and concern that the church gave up this man who restored them to their position of leadership. the church continued to welcome the colored members after the conclusion of the Civil War and also encouraged them to apply for letter of transfer when going to other churches. An item of interest occurred on May 6th 1865. All services for that Sunday were canceled because of the presence of "a Yankee raiding party in the area." 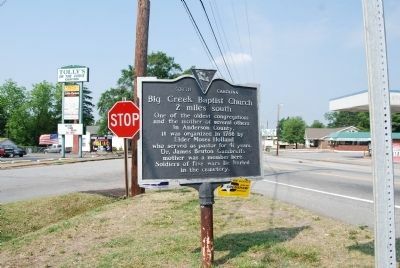 It must be noted that most of the preachers in those days served other churches on the Sundays they were not preaching at Big Creek. Dr. Wingo was replaced by Rev. R.H. Burris on January 1, 1911. A significant event occurred on August 6, 1911, when Rev. R.H. Burriss baptized 22 new converts in the church baptismal pool. which were donated by Dr. J. F. Wilson. Dr. Wilson shipped the light fixtures from Indiana and also contributed to their installation. The men of the church volunteered to provide and install cedar poles that would be necessary to bring the electrical wires to the church. During 1927 the minutes indicate that a number of letters, which were requested were denied because the person in question had failed to contribute to the pastor's salary. The church at this time endorsed the stand of Governor Richards to enforce the law against breaking the Sabbath. The first choir loft was erected in 1924. On October 3, 1926 the church voted to reelect Rev. McCuen for the year 1927 and to accept his offer to serve as full-time pastor, preaching every Sunday at a salary of $600 per year and that he would pay $50 of his own salary, leaving the church $550 to pay in meeting his annual salary. This agreement included preaching four Sundays each month and two sermons on each Sunday, one in the morning and one in the evening. On August 5, 1927 this was modified to allow Brother McCuen to preach at Eureka Baptist Church on the third Sundays and that his salary be reduced to $500 per year, as Eureka would pay $100 per year for his ministry. of the year had passed and he had only received $110. Brother McCuen remained as pastor until the end of December 1930, at which time he resigned to accept a call elsewhere. He was replaced by Rev. H.E. Marlow, who remained only two months, which was apparently only on an interim basis. On August 9, 1931 the Church elected Rev. C.H. Hamby as pastor to preach the first and third Sunday mornings at a salary of $20 per month. It must be noted that this period of time was identified as the height of the famous depression that swept the nation. Money was scarce and jobs were difficult to find. In this area many men were unemployed and families were faced with problems that they found hard to accept. Rev. Hamby served the church very efficiently for five years, resigning March 15, 1936. Rev. George L. Roberson was elated pastor on May 17, 1936 with preaching on the first and third Sunday mornings at a salary of $20 per month. 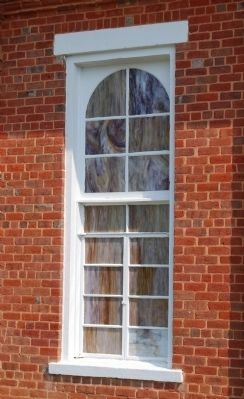 It was during this period that the church started a fund to build Sunday School rooms at the rear of the church. Up until this time the sanctuary was partitioned off by curtains run on wires, to serve as individual Sunday school rooms and then drawn aside for the morning worship. 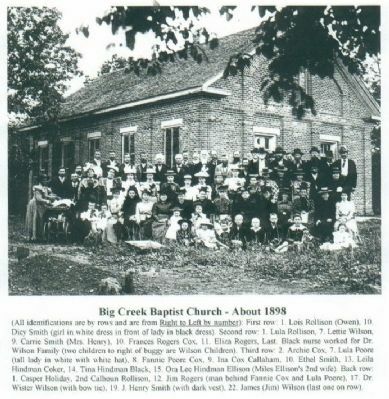 On May 29, 1938 Big Creek Church celebrated its 150th Anniversary. The event was an all day affair, with addresses by Rev. George Roberson and former pastor Rev. 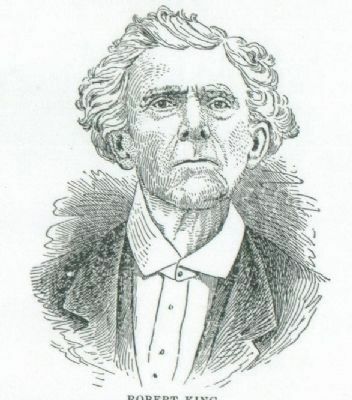 The founder of the Saluda Baptist Association, and of Big Creek, Hopewell, Neal's Creek, Friendship, Barkers Creek, Washington, Standing Springs churches and perhaps Twenty Six Church. He was Pastor of Big Creek Church forty-two years. C. H. Hamby. There was much singing, and the church’s history was reviewed by Mr. J. A. Dunlap. The attendance was most outstanding and the attendees enjoyed a wonderful noon meal outside "on the grounds", served by the ladies of the church. Rev. Prue H. Kelley, "a local boy", was called as pastor beginning in 1939 and continued through the year, followed in 1940 by the Rev. Roy O. McClain, who was an outstanding ministerial student at Furman University in Greenville, S. C. Some years later, Rev. McClain was recognized as one of the ten outstanding young ministers in the United States. It was during Bro. McClain's ministry at Big Creek that the Sunday School addition was completed, which provided eight class rooms and a basement. Rev. McClain resigned as pastor in mid 1942 in order to enter the Southern Baptist Seminary. a responsive support for the churches. On August 22, 1944 Brother McGaha resigned to become full time pastor at Enoree Baptist Church. Rev. Thomas L. Brown was elected pastor for the remainder of 1944 and also served until the end of 1945. In his tenure, the church installed a central heating system at a cost of $900. 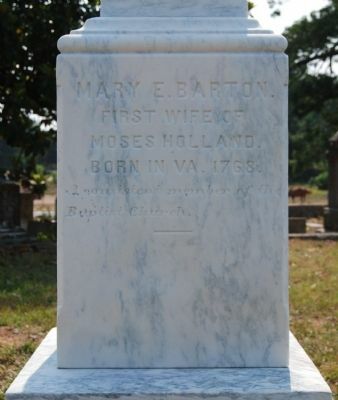 Marton was Moses Holland's first or second wife, depending on the research. In total, Moses Holland may have been married three times. resigned in 1967 to accept a call to Toccoa, Georgia. Rev. Fred N. Cobb was called as pastor to replace Brother Timms in 1967. On January 7, 1968 a ground-breaking ceremony was held to launch the building of a new sanctuary. The church had occupied the "Old Church" for 93 consecutive years, so it is easy to understand the importance of this event and the feelings that still exist toward the "Old Church". The new sanctuary was completed and the dedication of the beautiful church was celebrated on August 4, 1968, at which time Rev. Cobb brought the message, assisted by former pastors Dr. E. F. Rabine and Rev. Melvin H. Timms. Rev. Cobb gave his resignation to be effective January 31, 1971. Rev. 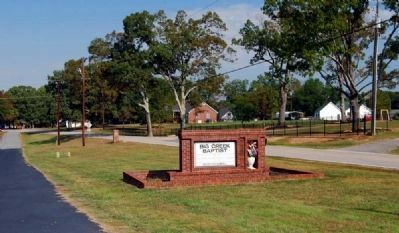 Paul Mabry, former pastor of Williamston First Baptist Church, most effectively filled the pulpit as interim pastor until a full time pastor could be secured. On March 28, 1971, the church called Rev. Faye Lanford as their pastor. Brother Lanford preached his first sermon as pastor on March 16, 1971. During this time the pastor's salary had grown to $165 per week. Brother Lanford served the church well and it was with great reluctance that the church accepted his resignation on June 1, 1975. Rev. Paul Mabry again stepped in as interim pastor. Christian at an advanced age. from his first pastorate at Big Creek and the congregation had many fond memories of him and his wife and much faith in his ministerial abilities. His initial salary was to be $238 per week, plus his utilities. On May 2, 1976 the church voted to build a new modem pastorium on an acre lot purchased across the highway from the church. This project was completed in March of 1977 and the lovely brick parsonage was dedicated with an open house celebration on March 6, 1977. On March 17, 1980, there was much anguish and concern in the entire community when the new church, which was only 12 years old, burned to the ground. 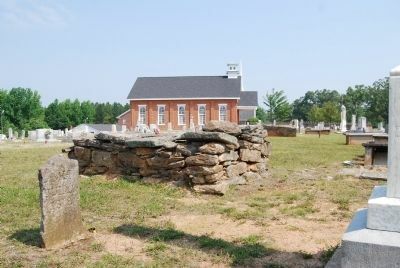 The historic "Old Church" was spared from critical damage and became a solid rock of hope and determination for the members, while plans and projects were developed to replace the destroyed facility. Joyfully, on August 2, 1981 at Homecoming Day, ground breaking was held for a new sanctuary and educational facility. On June 7th 1981 the proposed design for a new church was presented to the church and, after careful review, it was approved with a standing vote. 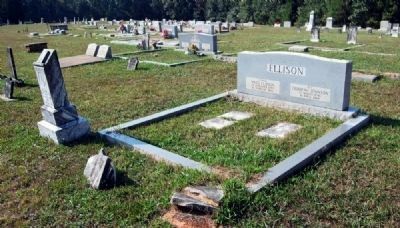 The low bid for construction was $386,984 submitted by Hall Construction Company of Belton, S.C.
new sanctuary. There were 185 in Sunday School and the offering for the day was $1,700. 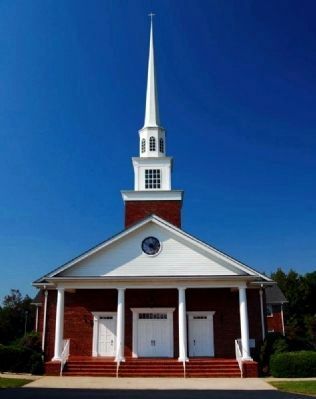 Prior to completion of the new building, the church had authorized the necessary repairs that needed to be made to the "Old Church" as a result of the fire. Also the Sunday School rooms at the rear of the "Old Church" were in such condition that it was determined best to remove them. The end result was a lovely new church and the restoration of the "Old Church" to its original appearance. — Submitted January 2, 2009, by Brian Scott of Anderson, South Carolina. Big Creek was Constituted in the year of our Lord - 1788, and formed the following Constitution and rules of Decorum. 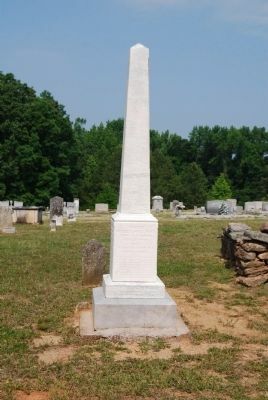 William M. 1827-1905 CSA Cedar Grove Bapt. Amaziah M. 1829-1864 CSA Petersburg, Va.
Greenlee H. 1835-1921 CSA, Cedar Grove Bapt. 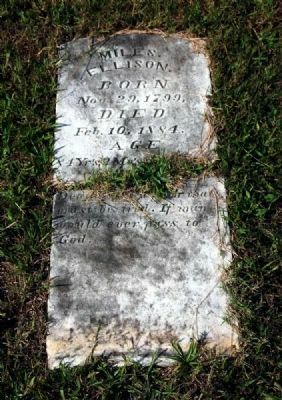 Miles Lewis Jefferson 1836-1908, CSA, Big Creek Bapt. Nancy M. Ellison Apr. 11, 1939 Dec. 31, 1921 Blount Co. Al. 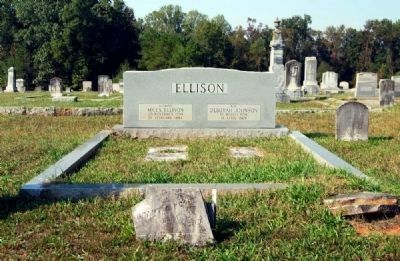 Erected by Carl G. Rllison, Truman W. Ellison and other descendants. 1. The Church Shall be opened and Closed by prayer. 2. A Moderator and Clerk Shall be Chosen by the suffrage of the members present if required. 3. The Moderator Shall be deemed a Judge of order and have a right to Call to order at any time. 4. Any member not Satisfied with his Decision on any point of order, may appear to the Church on the same Day but no other time. 5. But one person shall speak at a time and he shall rise to his feet and obtaining leave proceed. 6. The Moderator when addressed for leave of Speech shall signify by naming of them or otherwise. 7. No member shall be interrupted when speaking unless he Departs from the subject in hand, or uses words of personal reflection,and every motion made and Seconded Shall Come under Consideration of the Church, except withdrawn by him that made it. 8. Every Case taken up by the Church Shall be first decided or withdrawn before another is offered. 9. When anything is taken up by the Church after allowing time for Debate the Moderator Shall take the question and those in favour of the thing proposed shall rise, to their feet and those against it shall keep their Seats. 10. The Moderator Shall pronounce the Decision before the Standers take their Seats. of the Church without leave. 12. The Appelation of Brother Shall be used in our addresses one to another. 13. The Names of the members shall be Call'd as often as the Church may Direct. 14. No Member Shall be allowed in any practice that has a tendency to interrupt, in time of public Church. 15. The Moderator Shall be entitled to the same privilege of Speech as any other member provided he appoints Some other member to his Seat while he is Speaking, but shall not vote unless the Church be equally Divided. 16. Any person Breaking this Decorum Shall be reproved at the Discretion of the Church but only/the/Day the breach is made--And the Committee have proceeded to examine the papers & Records and find no Records older than 1801 where we find the following names, Male and Female, then members. Sept. 5. Church Convened Together, Query is it legal when a Query comes before the Church and it taken up by the Church and then threw it out and not give the Ans., it is not legal. Query and Cannot give the ans--- Answered acknowledge their fault to the brother who flung in the Query. Nov. 7. Church Convened---Samuel Cobb & Jesse Gray & Elizabeth Halbert & ware received by Experience, John Nickelson restored again into our fellowship. Feb. 6. Church met according to adjournment Bretheren Relph Owen & Elizabeth Owen restored to fellowship Brether Peter Acker Mary Bowen & Margiet Harper and was received by Experience. Brother Relph Owen & Elizabeth dismissed. April 2. The church met according to adjornment. First the above Allegation ajoins Brother Robert Jeffers brout forward and on his recantion was still retained in fellowship. The following Bretheren received into our fellowship by Exsperience VZ: Mary Grace Joel Holbert Archabald Nickels Sargh Gorder & Fanney Richerson Milley Read by letter. April 3. Presbetry conveaned. Having the Eldership of Brushy Creek Church Vs: Robert Ore, John Bray & James Head & Benjamin Northcut Enoch Breazeale invited to Seat with our to assist in the ordination of John Harper & Wm. Harper the Brethern called forward & Examened relatives to their faith and satisfaction was given by them, they ware ordained and set forward to their work - Church Convened together---. Recd. in to fellowship Thomas Smith by letter Sunday the 4 of April Communion held. May 1st. Church Convened together the following recd. by Experience once Vz. Jane Hambleton Sarah Cooley - John Wilson &Jane Findley Hugh Wilson senr. Black Loosee & Son Cy Wilson. May 2. Church came together - and rec'd by Experience sisters Mary Halbert and Jane Acker. Brethren Received into fellowship by Experiance to VA: Benjamin Farmer Sener James Halbert black peter & thomas Brown & Sarah Brown his wife then Revd. Joseph & Susanna Kelley by letter Sunday June 6th, the Church came together and Recvd. by Experance Ruth Acker Richard Hall Rec'd. into our fellowship. July 3. Church convened together the Rec'd. by Experience the following Brethren - Edy Parsons John pepper Charrity Duckworth patsy Greenlee - Nancy Johnson John Hunt Jemimah Thaxton John Salyer & Jennet Wilson. Sunday Oct. 3rd. Church come together received by Experance Black Peter Joseph Brown George Nelson. Novm. 13. The Church convened firs the above Allegation against Brother John Wilson brought forward & on his recantation is still retained in fellowship-- Secondly-Brethren John Harper & Wm. Harper Margret Harper & Elizabeth Harper Dismised; Thirdly - a petition from Salem metting house Arm of Shockley ferry Church requesting our Eldership as helps in sonstituting of them a body to themselves; their petition was granted---. Fourthly - a door being opened for the reception of members the following Brethern received into fellowship by Experance; Viz: Black Marey Adam Williamson Margaret Winson Elizabeth Crider Ann Williamson Sarah Griffin. Sunday November the 14th. Church came together then received by Experience Hesey Williamson Elizabeth Williamson & Hannah Williamson. — Submitted October 12, 2010, by Brian Scott of Anderson, South Carolina. This honored and beloved minister of Jesus Christ was born in Culpeper County, Va., November 17, 1758. He served as a soldier in the Revolutionary war, and was present at the surrender of Lord Cornwallis. The independence of the Colonies having been secured and peace restored, he emigrated with his wife and two children to South Carolina and settled in Anderson county, on the Saluda River, two miles below the present town of Pelzer, near what is known as Holland’s Ford. He came as a Christian and a Baptist, and proved himself as zealous and faithful in the service of his Heavenly Master as he had been in the service of his country. 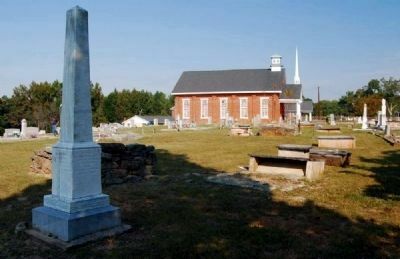 In 1788 the Big Creek Church was constituted through his instrumentality, and he was chosen and ordained pastor, which position he filled with great acceptability and success until the day of his death, which occurred on the 8th of September, 1829, a period of forty-one years. Where, when or by whom this saintly man and eminent minister was baptized we have no means of knowing, but he was often heard to say that he entered the service of his country and his Master both at the age of sixteen. He was present at the constitution of the Saluda Association, and, as has already been noted, chosen as its first moderator, which position lie filled to the satisfaction of the body and with honor to himself for many years. As an indication of his high standing as a preacher, he was frequently appointed to preach one of the annual sermons of the Association. And as proof of the high estimate his brethren placed upon his wisdom and judgment, his name appears on all of the most important committees. He was considered as authority on all questions of parliamentary usage and church discipline. He was widely known in upper South Carolina, and his popularity was co-extensive with his acquaintance. He was without doubt one of the most powerful, influential and useful preachers of his day. His whole ministerial life was devoted to pastoral work and the establishment of churches, in all of which his labors were most signally blessed. He was truly a pioneer preacher. And it is to his untiring efforts the Baptist churches of this section of the State, and especially those of Anderson County, owe their existence today. Big Creek, Hopewell, Neals Creek, and Friendship were some of the immediate results of his personal efforts. Deacon Joshua Holland, a highly-respected citizen of Anderson County, S.C., is a son of Elder Holland, and the only surviving member of his immediate family. — Submitted June 22, 2008, by Brian Scott of Anderson, South Carolina. — Submitted October 13, 2010, by Brian Scott of Anderson, South Carolina. — Submitted August 25, 2008, by Brian Scott of Anderson, South Carolina. 6. "Going Over to the Yankee Army"
More. Search the internet for Big Creek Baptist Church. Credits. This page was last revised on June 16, 2016. This page originally submitted on June 6, 2008, by Brian Scott of Anderson, South Carolina. This page has been viewed 9,931 times since then and 59 times this year. Last updated on June 20, 2008, by Brian Scott of Anderson, South Carolina. Photos: 1. submitted on June 6, 2008, by Brian Scott of Anderson, South Carolina. 2. submitted on August 28, 2008, by Brian Scott of Anderson, South Carolina. 3. submitted on October 12, 2010, by Brian Scott of Anderson, South Carolina. 4. submitted on June 26, 2012, by Brian Scott of Anderson, South Carolina. 5. submitted on October 12, 2010, by Brian Scott of Anderson, South Carolina. 6. submitted on August 9, 2008, by Brian Scott of Anderson, South Carolina. 7. submitted on June 6, 2008, by Brian Scott of Anderson, South Carolina. 8. submitted on August 28, 2008, by Brian Scott of Anderson, South Carolina. 9. submitted on January 3, 2009, by Brian Scott of Anderson, South Carolina. 10, 11. submitted on October 12, 2010, by Brian Scott of Anderson, South Carolina. 12. submitted on August 28, 2008, by Brian Scott of Anderson, South Carolina. 13. submitted on October 12, 2010, by Brian Scott of Anderson, South Carolina. 14. submitted on July 30, 2008, by Brian Scott of Anderson, South Carolina. 15. submitted on January 3, 2009, by Brian Scott of Anderson, South Carolina. 16. submitted on January 2, 2009, by Brian Scott of Anderson, South Carolina. 17. submitted on January 3, 2009, by Brian Scott of Anderson, South Carolina. 18, 19, 20, 21, 22. submitted on October 12, 2010, by Brian Scott of Anderson, South Carolina. 23. submitted on June 26, 2012, by Brian Scott of Anderson, South Carolina. • J. J. Prats was the editor who published this page. Editor’s want-list for this marker. Portrait of the Rev. Moses Holland. • Can you help?